The triumphant character of the 12th mode could hardly be more fully expressed than in this joyful work. The instrumentation is not specified, but the top two parts are almost certainly intended for violins: they descend to the tenor G, just off the range of the treble cornett. 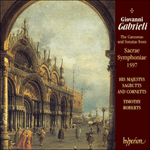 These concertante parts, full of scales and arpeggios, show how brilliantly Gabrieli could incorporate the virtuoso diminutions of the instrumentalists into a formal structure of the utmost simplicity and clarity. The brief opening tutti recurs five times, framing a series of episodes in which the soloists cavort in athletic competition, accompanied at first only by the lowest sackbuts and then by the other members of the ten-part band in a subtle display of cumulative orchestration. Gabrieli seems to invent the ethos of the Vivaldian double-violin concerto, over a century before its time.